About eight years ago the Lockhart River community on Queensland’s Cape York Peninsula became a prominent art-producing area because of the success of young artists such as Rosella Namok and Silas Hobson, collectively known as the Art Gang. Now their grandmothers have also begun painting, to great acclaim. The Old Girls (which is how they describe themselves) have shown work in Italy, France, the United States and the United Kingdom. Their exhibition with Andrew Baker at the end of last year included their largest and most ambitious paintings so far. The exhibition also included baskets, which are one of the key elements in understanding how a group of untrained artists could abruptly begin producing these complex and subtle paintings. Weaving and body painting have a strong presence as traditional arts at Lockhart River and many of the women have been weaving for 60 years. They use natural and synthetic dyes to produce elaborate banded patterns and colour relationships that are often reflected in their paintings. The painters (LÐR): Dorothy Short, Maria Butcher, Doris Platt, Elizabeth ÔQueenieÕ Giblett, Susie Pascoe. As well as the familiar dilly bag and fruit bowl shapes, the baskets often have a distinctive form reminiscent of an elephant’s foot, flat-bottomed and tapering toward the top. Some are ornamented with seeds, feathers and shells. The pastel colour combinations are wonderfully refined. 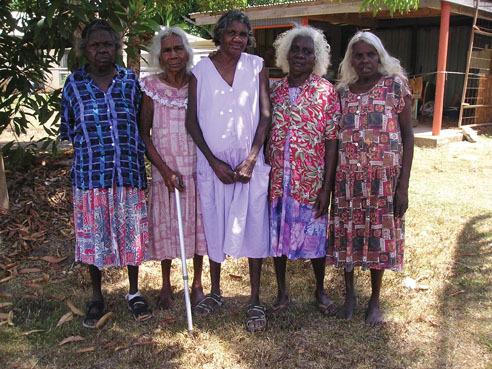 When Geoff and Fran Barker established the art centre at Lockhart River in 1995, to foster the enthusiasm for painting among younger members of the community, the senior women became involved, but not as painters. They sat with the girls, singing to them and teaching them language. This development made an important contribution to social coherence at a time when rifts had begun to form between generations at Lockhart River. Andrew Baker, whose close relationship with the community extends back to the beginning of this decade, first mentioned to the older women in 2003 that they too should try painting. They started when Camille Masson-Talansier was coordinator of the Lockhart River art centre during 2007 and 2008. She encouraged what she calls ‘inter-generational art making’, with three generations working and exhibiting together. In contrast to Indigenous communities elsewhere in Australia the rise of painting at Lockhart River was generated by young people, not the elders. There is, however, no apparent influence from young to old artists, either in style or content. The older women immediately established painting styles that are quite distinct from the work of their granddaughters, applying paint with brushes, rather than spreading it directly across the surface in the technique that identified early Art Gang works. Dense patterning is also much more prominent in the paintings of the older group. Sometimes this appears as combinations of distinct, contrasting areas, sometimes as a continuous field. Elizabeth (Queenie) Giblett and Maria Butcher use tightly repetitive motifs that resemble weaving patterns. Some of Giblett’s paintings have a river curving through this elaborate grid, while her most abstract works refer directly to the ceremonial armbands and headbands that she weaves. Doris Platt paints striated bands that swell and contract like landscape contours. Susie Pascoe and Dorothy Short paint landscapes in a more representational way, in rhythmic combinations of mountains, rivers and trees that correspond with the view of the country they have when travelling by air (which during the six month long wet season is the only way in or out of the community). There is a loose, organic character in paintings by Pascoe and Short that give free rein to the expressive properties of the medium. The work of these senior artists is very different from the broad, confident, gestural paintings of the Art Gang. There is considerably more detail and it is often combined with complex, highly accomplished colour harmonies. The traditional approach to picture-making, a way for artists to tell their stories, may explain why the older artists at Lockhart River produce such deeply engaging works. At their age, there is a lot more story to tell.